Told going out on draft following day – issued with rest of gear – made special trip to Cairo to get Xmas presents for sending home. Pictures in camp at night. Reveille at 5AM. Paraded at 7AM. Leaving Maadi at 7.30AM – through Cairo – then passed pyramids and along desert road. Struck sand storm nearing El Amyria and rain & blowing hard afterwards. Arrived at 23 Battalion area at 6PM. Batt. situated on coast – roughly 40 miles from front. Not many of the old hands here – all new officers. Raining hard so slept in W Latham’s tent. B Latham sent to hospital with tonsilitis. Shift into his tent – small routine march in morning. P.T during afternoon – feel more satisfied here than at Maadi. Church parade – demonstration Bangalore Torpedo for destroying wire (a metal tube filled with explosives and equipped with a firing mechanism, especially for destroying barbed-wire entanglements, mine fields, etc.) Demonstration with Jerry 50cm anti-tank gun in afternoon. Wrote letters. Received orders to move up at night. Saw Kiwi concert party during afternoon. Brigadier spoke to Batt. in evening. Going to front line then to attack – 23rd Battalion receiving honor of being spearhead for Div. Large scale operations from coast to inland sea. Airforce hammering them first. 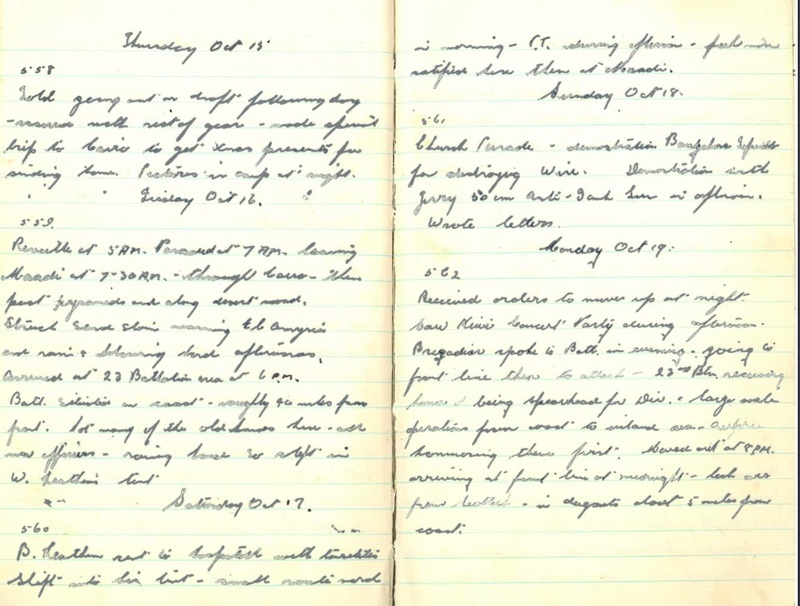 Moved out at 8PM arriving at front line at midnight – took over from Scottish – in dugouts about 5 miles from coast. “Airforce ??? there first.” I think “Airforce hammering there first” or “Airforce hammering them first.” And, yes, Scottish seems right.